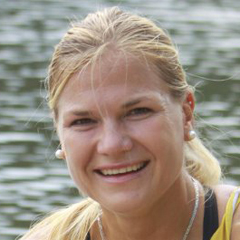 Cape Town - South Africa's Bridgette Hartley has won the bronze medal in the final of the women's Kayak Single (K1) 500m race at the 2012 London Olympics on Thursday. Hartley finished in a time of 1:52.923. The race was won by Hungary's Danuta Kozak (1:51.456), with Ukraine's Inna Osypenko-Radomska (1:52.685) in second place. Hartley's bronze medal is South Africa's fifth medal of the Games.